General-purpose professional. The smokehouse is designed for industrial and craft production of smoked meat products. It enables to carry out automatic thermal processing of smoked meat products, i.e. reddening, warming-through, drying, smoking, cooking, baking and showering without any additional handling operation. The UKM Central smokehouse enables the thermal processing of smoked products in the temperature range from 40°C to 110°C. All the steps of the process, i.e. reddening, warming-through, drying, smoking and cooking are carried out automatically without need of any additional manipulation between individual steps. 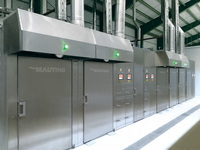 The horizontal smokehouses enables to carry out thermal processing of smoked meat products in particular on grates in the temperature range from 40°C to 110°C, i.e. reddening, warming-through, drying, smoking and cooking without additional handling operation. 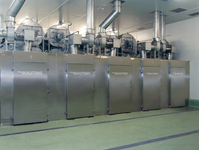 Smoking chambers are applicable for thermal processing of all types of products, e.g. : frankfurters, sausages, salamis, meat, poultry, fish, cheese, etc. The Compact smokehouses are intended for production of smoked meat products in small plants, large canteens and restaurants. 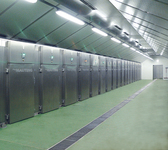 The smoking chamber enables to carry out the automatic thermal processing of smoked meat products, i.e. reddening, warming-through, drying, smoking, cold smoking, cooking and baking. Cooking chambers enable to carry out the automatic thermal processing by cooking. The whole process of automatic thermal processing is controlled by microprocessor control unit. The chamber is suitable for thermal processing of ham and similar products in leak-proof casings of moulds. By request it is possible to provide the chambers with higher heater output and stronger panels for cooking at temperature above 160°C which enable its use for baking of products. The UKM JUNIOR 03 smokehouse is designed for craft production of smoked products in small producing plants, large canteens and restaurants. The smokehouse enables to carry out the automatic thermal processing of smoked meat products, i.e. warming-through, drying, smoking, cold smoking, cooking and baking up to temperature of 160°C. Cooking chambers enable to carry out the automatic thermal processing by cooking. The chamber is suitable for thermal processing of ham and similar products in leak-proof casings of moulds.The horizontal cooking chamber is equipped with slots to ensure the optimal circulating air flow and temperature distribution.